1) Do You Know, If You, Your Parent Or Grandparents Have Lost Assets? 2) Did You Inherit Stock Or Other Assets And Don’t Know How To Handle It? 3) Are You Overwhelmed With The Process To Claim Lost Assets? Don't let unclaimed assets linger. If you think there might be an old bank account, inheritance claim, or other lost assets waiting for you in the larger financial world, US Asset Finders can help you locate them. We do all the work for you, including the paperwork, court hearings, and endless record searches necessary to locate assets. Once we've discovered lost or unclaimed funds, we'll make sure you recover every single cent that might be due to you. Residents of all U.S. states, as well as individuals residing outside of the U.S., can reach out to us for assistance. Best of all, we only charge when we're successful in recovering funds. Set up an appointment today to discuss your lost asset search-you've got nothing to lose and everything to gain. Call or email us today to get started. Find lost financial assets with our help. We can track down old paychecks, inherited stocks, and forgotten bank accounts, as well as any other assets in your name, so you can reclaim funds that should have been in your hands all along. Call today and receive a free search to discover if you have any lingering unclaimed assets-no risk and no obligations! 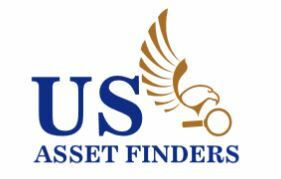 US Asset Finders has worked for more than five years to help individuals all across the country locate lost or unclaimed assets. We got our start after a personal search for lost assets inspired the realization that others might need this service as well. Since opening, we have worked hard to gather the knowledge, skills, and resources to effectively locate all types of assets, including those forgotten, lost in time, or misplaced over the years. We can help you recover funds or help you recover property that is rightfully yours.